Drug addiction has a reputation of being unchangeable. However, it is the view of these authors that a full cure from drug addiction or habitual addiction can be achieved. In this essay they address both the recovery and the long-term goal of healing from addiction. Combining both the principles of systemic therapy and experience gained through many years of counseling, they develop a unique model called "in-depth systemic" therapy. This model extends the classical systemic model by introducing and expanding on the 'mental' dimension of mental-somatic models. The central point of their work is the thesis that addicts themselves have to reorganize and restructure their own habitual ways of perception and cognition. Vipassana meditation serves as the instrument of choice to realize this transformation. Vipassana comprises an ethical lifestyle (moral conduct), concentration of the mind through meditation, and working progressively on one's own mental-somatic models. This essay is directed towards practitioners within the fields of drug addiction, psychotherapy, social work, life counseling and coaching who are interested in the development of the autonomy of their clients and their own autonomy. Meditators from the fields of awareness and wisdom will also find various connections to bring forward their development through exploring their direct experiences. Additionally, scientists concerned with the integration of theory and practice, as well as empirically-based theory building, will find much of interest. This eBook is in Mobi (Kindle), ePub (iPad, Android, other eReaders), and PDF formats. PDF eBooks are not printable. This small book of less than 100 pages is packed with valuable information that merits reading, and rereading. It is condensed from a comprehensive book in German that more fully explains the therapy. Start Again is a drug therapy clinic that uses an in-depth systemic treatment to help clients help themselves. The treatment presented here integrates therapies that are sociological, psychological, and neurobiological with the wisdom of the Buddha as taught and practiced in Vipassana meditation. The treatment model applied in addiction therapy can be extrapolated to such areas as psychotherapy, PTSD, prison inmate rehabilitation, executive training, athletics, lifestyle coaching, and more. Starting with a foundation of addiction therapy, family therapy, and self-help, meditation is then slowly integrated to help clients gain greater control, self-awareness, and deeper mental purification that allows them to restructure their lives with better wisdom to overcome old, self-defeating habit patterns. The Start Again programs are flexible to individual clients and may take up to 18 months or longer. On a foundation of therapy plus professional and social rehabilitation, the practice of anapana meditation (awareness of the breath) is introduced. Anapana is practiced twice a day from 30 to 60 minutes each. Over time with enough progress, the client will practice anapana with a full-day session once a month. If all aspects of the therapy and meditation provide a solid enough foundation, a 10-day Vipassana course at a center can be tried to eradicate the deep roots of the addiction (and other mental impurities). It should be emphasized that taking a Vipassana course must be a voluntary decision. One should never be pressured to take a course. The person should be ready, willing, and able to try the intense ten days of practice. As for the therapists: "What is valid for clients, is likewise valid for therapists." Self-practice of Vipassana is essential to help therapists understand what clients are working through, how this technique affects them, and to set an example that this is a way of life. Vipassana also helps therapists overcome personal biases and stereotypes of clients such as labeling them as having an "addicted brain" which would supposedly preclude them from coming out of addiction. Awareness of change in practicing Vipassana is reflected by greater awareness of change in the client and in the therapist him/herself. This book, like the Start Again therapy program, deserves six stars. But five is the max. P. S. It seems this program would be effective for veterans with PTSD, especially with other vets helping to run it. PTSD treatment might include Prolonged Exposure Therapy as a foundation, which also shows promise. 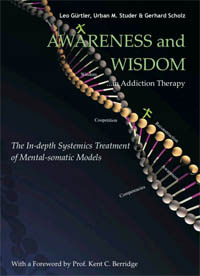 This book briefly presents In-depth Systemics, the unique treatment program offered since 1992 at Start Again (www.startagain.ch), a drug therapy center in Zurich, Switzerland. Central to that program is the teaching of Vipassana meditation, with which the authors themselves are deeply familiar. The authors examine the foundations of addiction and the various traditional models for understanding it. They then consider what is required to recover from addiction. This leads to a model that is based on the teaching of the Buddha, but that allows for integration of traditional approaches to fostering personal autonomy. The model can be applied not only to addiction but to the more general field of personal development. The book ends with a short description of Start Again, its evaluation study and case studies. Awareness and Wisdom is meant for practitioners in the fields of drug addiction, psychotherapy, social work, life counseling and coaching who are interested in the development of their clients' and their own autonomy. It is also meant for meditators and scientists concerned with the integration of theory and practice, as well as empirically based theory building.